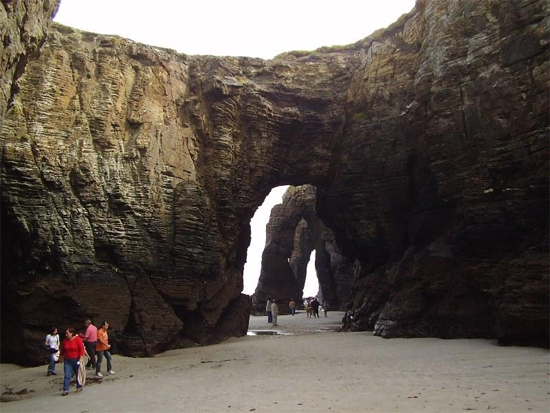 The Beach of the Cathedrals (As Catedrais in Galician), situated in the municipality of Ribadeo in Galicia’s Lugo province, has been declared a Natural Monument by the government of Galicia’s Ministry of the Environment (Consellería de Medio Ambiente). Although its true name is Holy Waters Beach (Augasantas), it is called ‘The Cathedrals’ because of its giant rock formations. According to an extensive international survey carried out by a Spanish travel site, As Catedrais was recently elected Europe’s Most Beautiful Beach. The runner-up was Sardinia’s La Pelosa Beach (Italy), followed by Cleopatra Beach in Alanya, Turkey where Marc Anthony and Cleopatra enjoyed the most idyllic days of their tryst in 34 B.C.E. Tsambika Beach in Rhodes, Greece, has fourth place while the last of the top five is CBeach in Cannes, France. What sets this beach apart is the cluster of impressive rock formations which embellish it, turning it into a magical place where permanent erosion due to the wind and the powerful sea have sculpted arches over thirty metres high which recall the flying buttresses of cathedrals. To fully appreciate this natural display, which looks as though it belongs on a movie set, the site should be visited at low tide. Once the tide has ebbed, let Mother Nature guide you on a tour of the great sand beach. During your stroll of around 300 metres, you will enter narrow grottos which then give onto spectacular open-sky seascapes; contemplate the improbable forms sculpted into the rock and the great arches which follow one another; and walk along paths made of particularly soft, white sand. This is a place where the very concept of ‘beach’ takes on a new dimension. Your visit to these ‘cathedrals’ should also include a swim in the clear waters of the Cantabrian Sea (also known as the Bay of Biscay). The beach is reached via steps which give directly onto the only small area which remains dry during high tide - at least when the water level is not higher than usual. Once there, you can begin exploring the beach. I recommend that you take your time and discover these admirable structures as if you were visiting an open-air museum. Try climbing some of the rocks, as the higher vantage point gives you a different perspective than that from the beach. And don’t hesitate to enter all of the grottos you see, whether an exit is immediately visible or not - pleasant surprises await intrepid explorers! 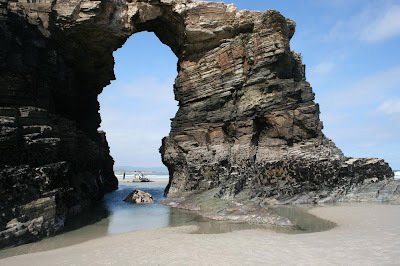 While it is true that the Cantabrian Sea can be a bit cold for swimming this time of year, do not let the tidal pools at the mouth of the grottos intimidate you - the water is unlikely to be more than knee-deep, and the caves are well worth the effort. At the end of the path you will discover the site’s finest feature: three consecutive arches which will welcome you in all their grandeur. 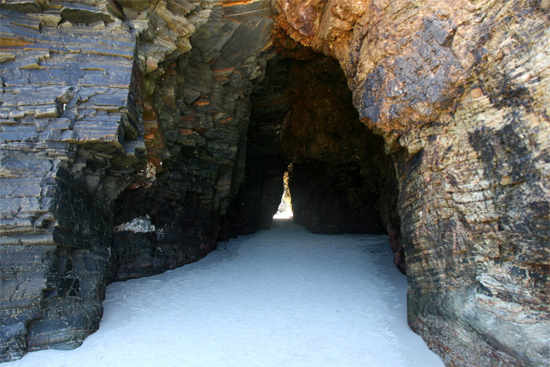 Bring your camera - this is one of the most frequently photographed spots of the beach, and perhaps even of all Galicia! These arches compare favourably with the buttresses of the most magnificent cathedrals ever built by man. On your return, keep going straight instead of climbing back up the stairs. This section of the beach may not be as spectacular as the other side, but the lovely view of the steep rock faces which are home to multitudes of barnacles and mussels are well worth discovering. When you have visited the beach from one end to the other, I recommend that you seek out the paths parallel to the car park which overlook the seaside. If the view of the beach as seen from atop the rocks is exceptional, the beach seen from this vantage point is different again. This is also a good place to see the whole vista if you’ve arrived at The Cathedrals during high tide or if the tide began to rise during your walk on the beach. If you want to continue on, a wooden catwalk follows the coast to Reinante beach. Finally, I would suggest that you consult the tide tables before your excursion in order to take full advantage of your time at The Cathedrals. Remember to bring along comfortable beach shoes and a bathing costume or trunks. And most importantly, once you are down on the sand, pay attention to the tides so as not to be startled by the rising water! The beach disappears at each high tide, becoming once again the magical paradise of fish whose turn it is to enjoy the splendours of one of the most beautiful natural sites in Europe.